All of our replacement Marvel 8 Band Wheels are"Always In Stock"
Replacement Marvel 8 Chip Brush Parts • Replacement Marvel 8 Coolant Pumps • Replacement Marvel 8 Drive Line Parts • Replacement Marvel 8 Electrical Parts • Replacement Marvel 8 Feed System Parts • Replacement Marvel 8 Guide Parts • Replacement Marvel 8 Handles & Latches • Replacement Marvel 8 Vice & Table Parts • Replacement Marvel 8 Wheel & Pinion Assm. Bushing for chip brush shaft. The Chip Brush Shaft Assembly consists of a shaft and a miter gear. It's located in the chip brush assembly. Miter Gear for powered brush assemblies for Marvel 8 Mk II. Also known as a blade brush or wire wheel. The Chip Brush removes shavings from the saw blade teeth to increase production and blade life. Sold as a pack of two brushes. The Chip Brush Block Assembly is located on the rear of band wheel cover. The assembly consists of the block and two bushings. Bushings for chip brush block P AB 8-1132 (2 required). Shaft for chip brush. Located in the chip brush block. The Delrin Gear or Bevel Gear powers chip brush assembly from band wheel. Roll Pin for Marvel 8 Chip brush. The roll pin retains miter gear P AB 8-1137 to shaft P AB 8-1134. Miter Gear for chip brush assembly located on shaft P AB 8-1134. A wire mesh screen or strainer that clears debris from coolant before pumping located in the coolant tank. Replacement screen for P AB 8-1119-R.
Solenoid Valve for Marvel 8 Mk I and 8 Mk II located on coolant pump. Turns coolant on and off electrically. Coil for Coolant Solenoid Valve (P AB 8-1223). Ball Bearing is in the rear of the drive spline bearing housing. Ball Bearing in the front of the drive spline bearing housing. Retainer Ring or Snap Ring that retains ball bearing P AB 8-1004 on to the drive spline sleeve. Double Row Bearing or Ball Bearing for the pivot drive pulley on back of saw head. Spur Gear for band speed indicator. Hex Coupling for band speed adjustment. Each machine requires two. Ball Bearing located in rear of countershaft bearing housing. Idler Shaft and Washer for older Marvel 8 with step pulleys. Drive Variable Speed Pulley located on motor. Adustment Knob for band speed. Driven Variable Speed Pulley located on the counter shaft. Also recommended is belt P AB 8-1185. Variable Speed Belt for Marvel 8 Mk I and Mk II. The Drive Belt is located between the counter shaft and the drive spline. The Drive Belt is located between the pivot bearing pulley and the drive pinion. Drive Belt for Marvel 8 with step pulleys. Sliding Spline Shaft Assembly for older Marvel 8. Consist of spline shaft, coupling, and 2 snap rings. The spline shaft transfers power from the motor to the step pulleys. Main Drive Spline Sleeve or Brass Sleeve drives the spline shaft from the motor. Also recommended P AB 8-51 rear sleeve bearing and P AB 8-52 front sleeve bearing. Oil Cup for main drive spline sleeve bearing blocks on older Marvel 8 band saws. Each block requires (1) oil cup. Driven Variable Speed Pulley for Marvel 8 Mk II band saws. Also recommended is belt P AB 8-1185. Arm Bracket for idler pulley on older Marvel 8 bandsaws. Idler Pulley Assembly for Marvel 8 bandsaws with step pulleys. Also recommended P AB 8-120 belt. Needle Bearing for upper step pulley (2 required). Rear Sleeve Bearing for main brass drive spline sleeve. Forward Sleeve Bearing for main brass drive spline sleeve. The Drive Sprocket is located on the main drive spline brass sleeve. Drive Chain (112 Links) drives the main drive spline sleeve from motor on older Marvel 8. Drive Chain (114 Links) drives the main drive spline sleeve from motor on older Marvel 8. Drive Chain (116 Links) drives the main drive spline sleeve from motor on older Marvel 8. Drive Chain (110 Links) drives the main drive spline sleeve from motor on older Marvel 8. Drive Chain (102 Links) drives the main drive spline sleeve from motor on older Marvel 8. Lamp Housing Assembly for Marvel 8 and 8 Mk I located on upper band wheel door. Lamp Housing Assembly for Marvel 8 Mk II located on upper band wheel door. Micro Switch is located in the front electrical panel and shuts down the machine when the saw head reaches the front stop block. Contact Block for 30mm start or stop switch. Red Push Button for Marvel 8 and 8 Mk I. Spring Release. Selector Switch for coolant and lamp on Marvel 8 Mk I.
Transformer for control voltage for Marvel 8 Mk II (230V/460V). 3 Position Maintained Selector Switch with 2 N.O. and 1 N.C. contacts. This switch controls the coolant system on 8 Mark II saws. Door Interlock or safety Switch for Marvel 8 Mk II. Door safety actuation key to be used in conjunction with the door interlock switch. Bronze Bushing for feed slider.The feed slider engages and disengages feed system. The Link couples together the eccentric shaft and the feed slider. Bronze Bushing for bearing block which contains eccentric shaft for feed system. Feed Lever also known as tilting lever used to engage feed on a Marvel #8 Band Saw. Bearing for saw head carriage located under machine table. Each machine requires four. Roll Pin for P AB 8-1071. Handwheel for feed system on Marvel 8 Mark I. Bronze Bushing in balance beam head for feed system. Eccentric Pin for tilting lever on older Marvel 8 band saws. Oil Cup Press-In Type for tilting lever. Feed Worm or Spiral Gear for feed system. Also recommended worm gear P AB 8-251. Typically replaced as a set. The Feed Belt drives the feed pulley from the main drive spline sleeve. This Feed Chain is located under the machine table between the chain bar and the equalizer chain. This Equalizer Chain is located under the machine table on the front of the saw carriage. Worm Gear or Brass Gear for the feed system. Also recommended feed worn P AB 8-171. Cork Insert for feed system friction clutch. Each machine requires six. Feed Pulley Bearing or Needle Bearing for feed pulley. Needle bearing replaces solid brass bushing in older machines. Inner Race for bearing P AB 8-263A located on end of worm shaft P AB 8-170. Thrust Collar located on worm shaft P AB 8-170 transfers feed pressure from balance beam to worm shaft. Thrust Bearing located on worm shaft P AB 8-170 reduces friction between thrust collar and balance beam. The Handwheel (Old Style) is for positioning saw head. Feed Lever engages and disengages feed system on older Marvel 8. Hand Wheel Shaft for older Marvel 8. This shaft is located under front of machine table. This Feed Chain is located under the table in the rear of the machine. This chain runs from the chain bar around the tensioner to the back of the saw head carriage. Sprocket and Hub Assembly located under front of machine table on handwheel shaft P AB 8-C133. Each machine requires two. Flanged roller guide for older Marvel 8 bandsaws. Used with Part # P AB 8-127 P to Support Sawblade. 2 are required. Thumb Screws are used to adjust the guide blocks for blade alignment. Lower guide segment for the old style Marvel 8 . This part fits older style roller guide machines. Carbide Guide Posts for Marvel 8 with blade guide conversion, 8 Mk I and 8 Mk II. Pressure Block Assembly or Back Up Guide for Marvel 8 with blade guide conversion, 8 Mk I and 8 Mk II. The Clamp Ring Stud tightens clamp ring to prohibit tilting of the saw head. Handle Stud for P AB 8-1079. Clamp Screw for positioning guide arm. Handle Stud for P AB 8-1139 and P AB 8-1140. Ball Knob for P AB 8-1141 and P AB 8-1079A. Paddle Latch for lower band wheel door. Lower Bandwheel door for Marvel 8 Mk I. Allows for Sawblade to be Tensioned. Ratchet Mount on one end. Idlewheel Casting and Tension Stop on other end. Plastic Door Latch for Marvel 8 Mk II upper band wheel door. Ratchet Wrench for tensioning saw blade. Steel Wear Strips protect the machine surface from wear due to the loading and unloading of material on and off the machine table. They are manufactured from spring steel for long life and are sold on a per piece basis. Vise Screw or Set Screw for rear vise ratchet nut. Steel Square Insert for ratchet nut (P AB 8-48-R), also recommended P AB 8-154 spring. Vise Jaw Assembly consists of front and rear jaws. Ratchet nut Assembly consists of (1) P AB- 8-48 ratchet nut, (1) P AB 8-156 steel insert, and (1) P AB 8-154 spring. They allow quick positioning of vise jaws. The Vise Screw with Handle consists of a chrome balanced crank handle and a vise screw which has been turned back on end to prevent mushrooming of threads. 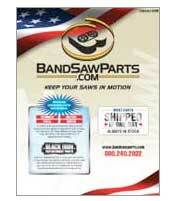 Hardened Wear Strips mounted on Sawbase nearest to Sawblade and are sold on a per piece basis. Hardened wear Strips mounted on Sawbase left and right of part # P AB-AA004A and are sold on a per piece basis. Replacement Marvel 8 Wheel & Pinion Assm. Lower Wheel Bracket is located on the lower saw head. Bevel Gear Shaft or Pinion Shaft for Marvel 8 Mark I and newer machines. Also recommended (2) P AB 8-1029, (3) P AB 8-1028. Retaining Ring for drive pinions and drive wheel shafts. Each shaft requires three. Internal Retaining Ring or Piston Ring for pinion housing. Upper Bandwheel (1" blade ) for Marvel 8 Mk I and II. Upper Bandwheel Assembly (1" blade ) for Marvel 8 Mk I and II. The assembly consists of (1) P AB 8-1200 band wheel, (2) P AB 8-1029 bearing, (1) P AB 8-214 snap ring, and (1) P AB 8-1200A bearing sleeve. Bearing Sleeve retains bearings in bandwheel P AB 8-1200. Lower bandwheel Shaft for Marvel 8 and 8 Mk I. Also recommended are (3) retaining rings P AB 8-1028 and (2) bearings P AB 8-1029. Lower Bandwheel Assembly with bevel gear for Marvel 8, 8 Mk I and 8 Mk II with 1' blade. It is recommended when replacing the lower wheel that the drive pinion(P AB 8-15A or P AB 8-1027) be replaced also. Lower Bandwheel Assembly with bevel gear for Marvel 8 and 8 Mk I with 1' blade. Assembly consists of (1) P AB 8-1205 Bandwheel, (2) P AB 8-1029 bearing, (3) P AB 8-1028 snap rings and (1) P AB 8-1202 shaft. Upper Bandwheel Shaft for Marvel 8 Mk I. Brass Bushing for pinion housings on Marvel 8 bandsaws with bevel pinion shaft (P AB 8-15A). Each housing requires two. Thrust Bearing for tension assembly which tightens saw blade. Saw Tension Screw is a threaded shaft used to tighten the saw blade. Ratchet Mount on one end Idlewheel Casting and Tension stop Mounts on other end. Bevel Pinion & Shaft for older Marvel 8 Band saws. Also recommended (2) pinion bushings P AB 8-12B. Lower Bandwheel Shaft for Marvel 8 Mk II. Also recommended are (3) retaining rings P AB 8-1028 and (2) bearings P AB 8-1029. Lower Bandwheel Assembly with bevel gear for Marvel 8 Mk II with 1' blade. Assembly consists of (1) P AB 8-1205 Bandwheel, (2) P AB 8-1029 bearing, (3) P AB 8-1028 snap rings, and (1) P AB 8-1602 shaft. Piston Ring or Internal Snap Ring for pinion housings and bandwheels. The Groove Pin retains the lower bandwheel shaft in to the lower wheel bracket. Main Idler Wheel Bushing retains idle wheel on upper bandwheel shaft. Oil Seal to retain grease in rear of upper bandwheel. Lower Bandwheel Assembly with bevel gear for Marvel 8 with 3/4' blade. It is recommended when replacing the lower wheel that the drive pinion(P AB 8-15A) be changed also. Lower Bandwheel Assembly with bevel gear for Marvel 8 with 3/4' blade. Assembly consists of (1) P AB 8-B16 Bandwheel, (2) P AB 8-1029 bearing, (3) P AB 8-1028 snap rings, and (1) P AB 8-1202 shaft. Upper Bandwheel (3/4' blade) for older Marvel 8.